Our first port on the 7-night cruise was Skagway, Alaska. The ship docks near town and you can get off the ship to explore. Tours are available to do a variety of different activities from historical tours to zip lining. 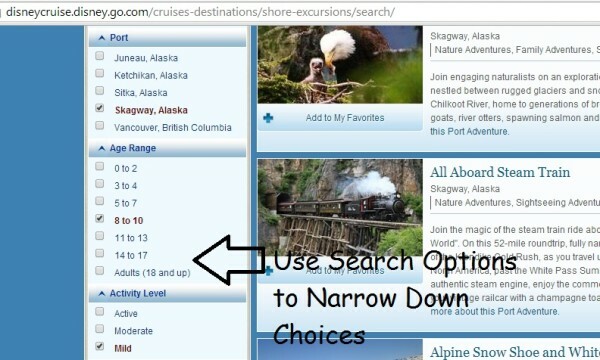 The Disney Cruise website is full of resources and information and especially user-friendly when it comes to choosing a land adventure. You can independently book tours but when you reserve a Port Adventure with Disney Cruise Line, “Disney has your back”. If there are any problems during the tour, or for any reason you need assistance, you can count on Disney for first-rate service. 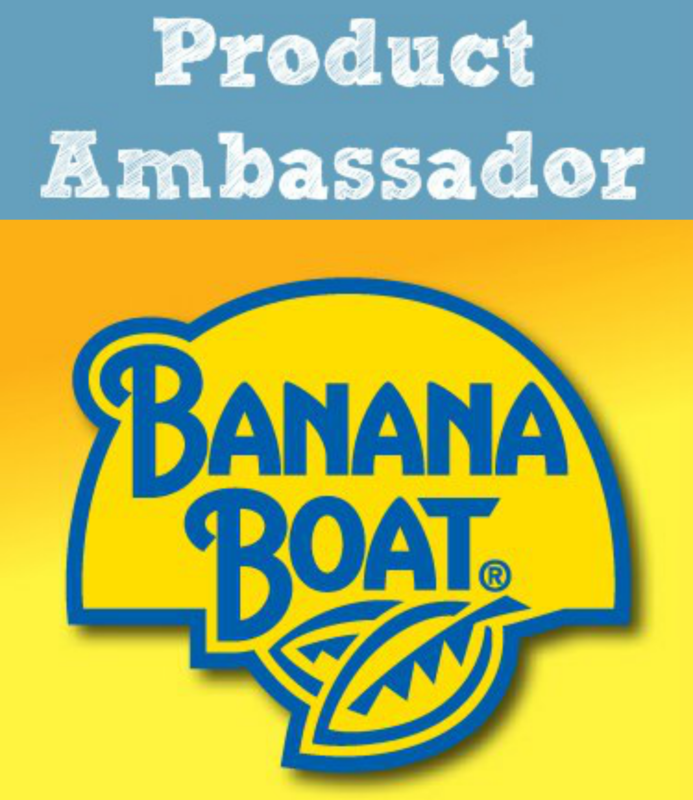 Disney has researched and you can be sure you are getting the best of the best. On the site, there is a whole list of reasons why it’s safer and stress-free to choose your tour through Disney. When our family was looking at the numerous choices, I explored the options and then summarized for a family meeting. We all made our top picks and surprisingly it was easy to find agreement. One thing I loved about the Disney website is the sorting capabilities. You can put in the activity level you want (Active, Moderate, Mild) and/or the ages of the guests. Since we were traveling with a range of 7 to 86, those options were wonderful for us to be able to narrow down the wide range of choices immediately. Even with those fairly restrictive parameters, we still had 19 choices! 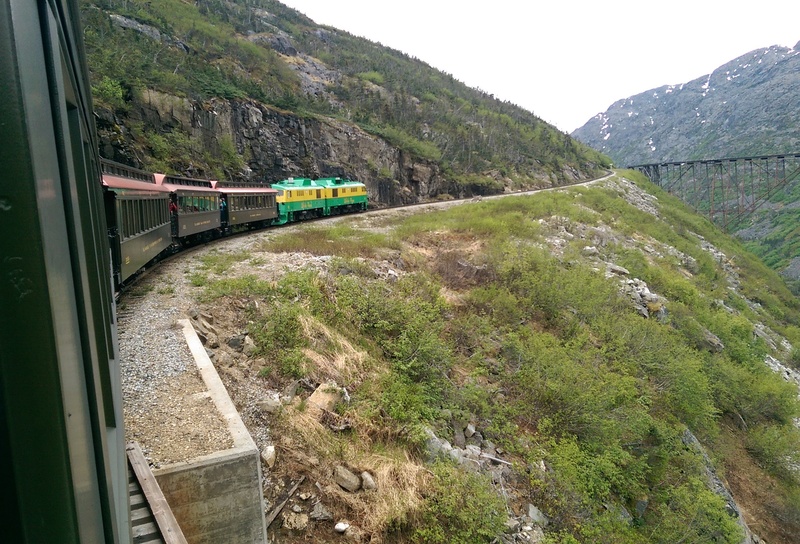 Skagway is called “the gateway to the Klondike”and is rich in stories about the Gold Rush. We chose the “Yukon Expedition” Port Adventure because it had something for everyone in our family. 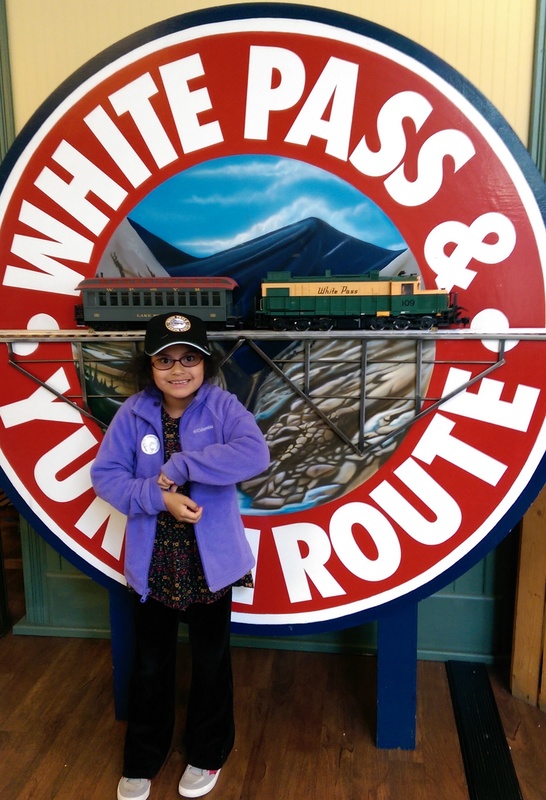 One of the things I especially wanted to experience was the White Pass and Yukon Railroad, which I had heard was a not-to-miss attraction. 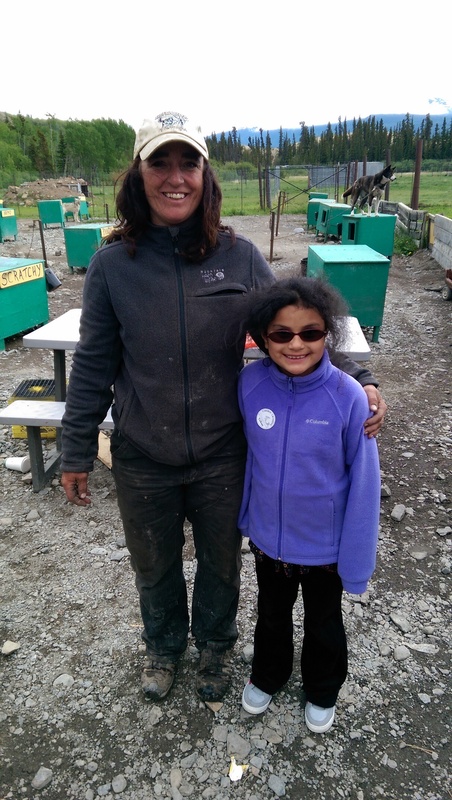 The tour included a stop at a Musher Dog Camp which I knew my daughter would love. 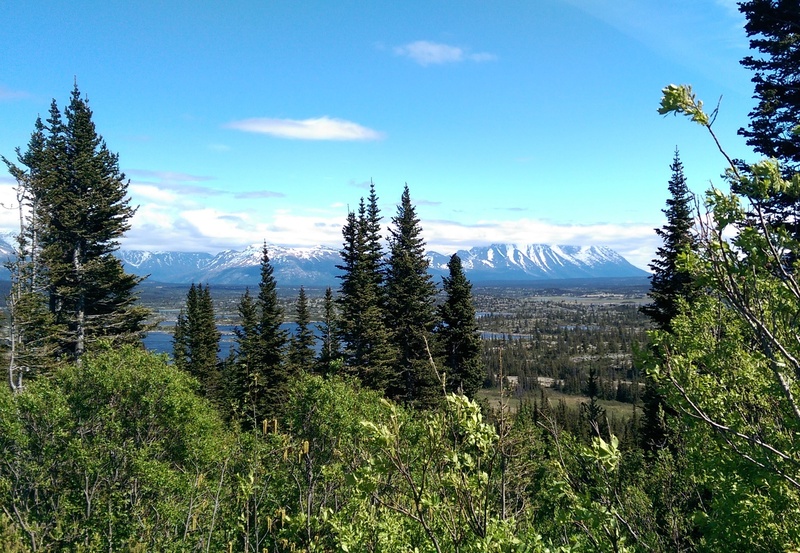 My husband and my mom especially wanted to see the wilderness and landscape of the region and a 75-minute drive included stops to view majestic peaks, waterfalls, and glaciers. At one stop we learned about the “inuksuk” – a stone landmark or cairn originally built by the native Inuit peoples. 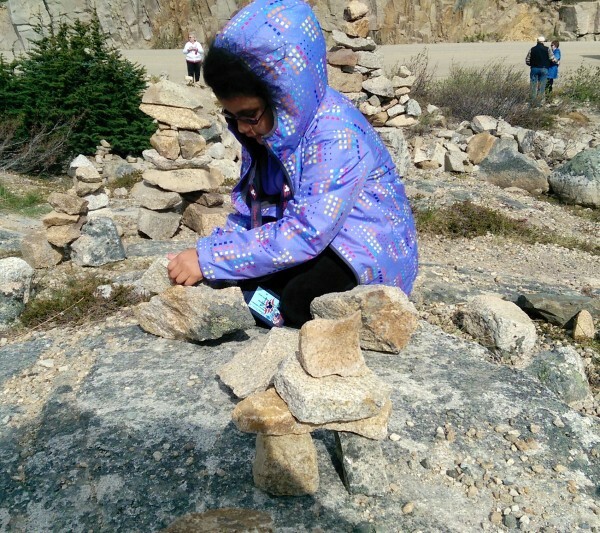 Visitors to this spot, left their own inukuk structures. 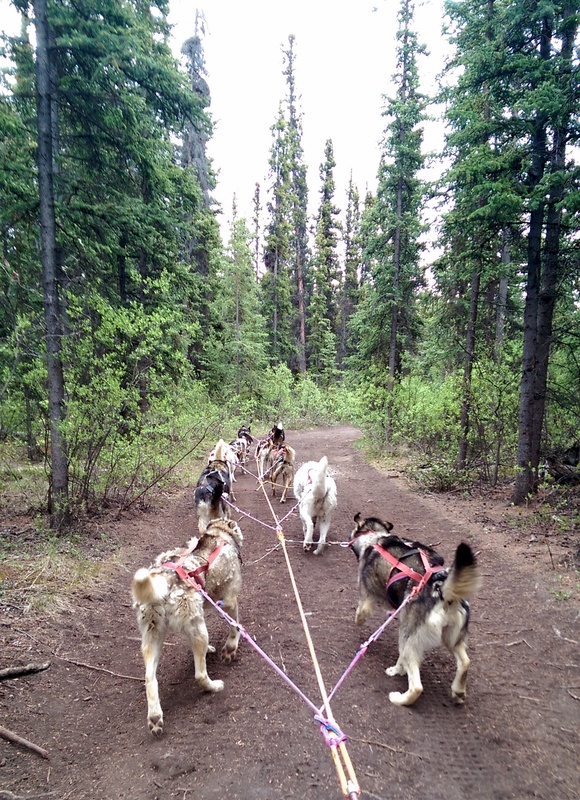 We stopped for lunch at Caribou Crossing, where the musher dogs captivated my daughter. She and I rode behind a team (without snow, our sled had wheels) for a trip through the nearby forest. 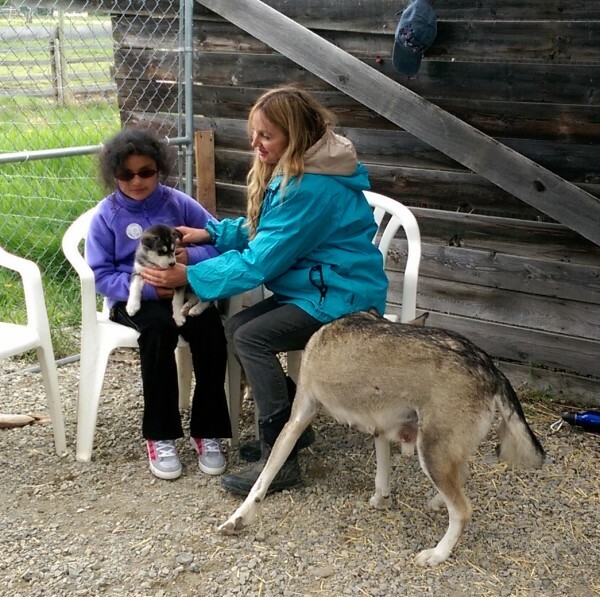 Then she had an opportunity to play with some of the dogs and hold a puppy that would someday be part of a musher team. The woman taking care of it told us that puppies from champion mushers sell for as much as $30,000. 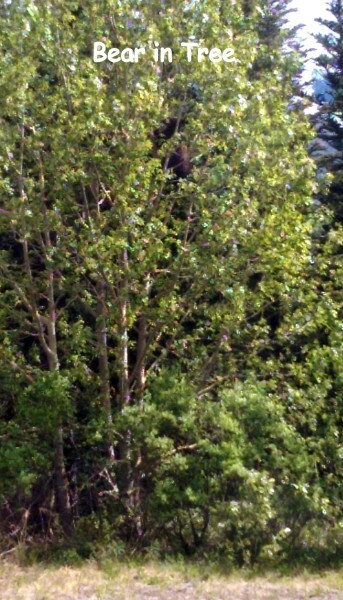 Our tour guide pulled over at one point, because he spotted a bear! 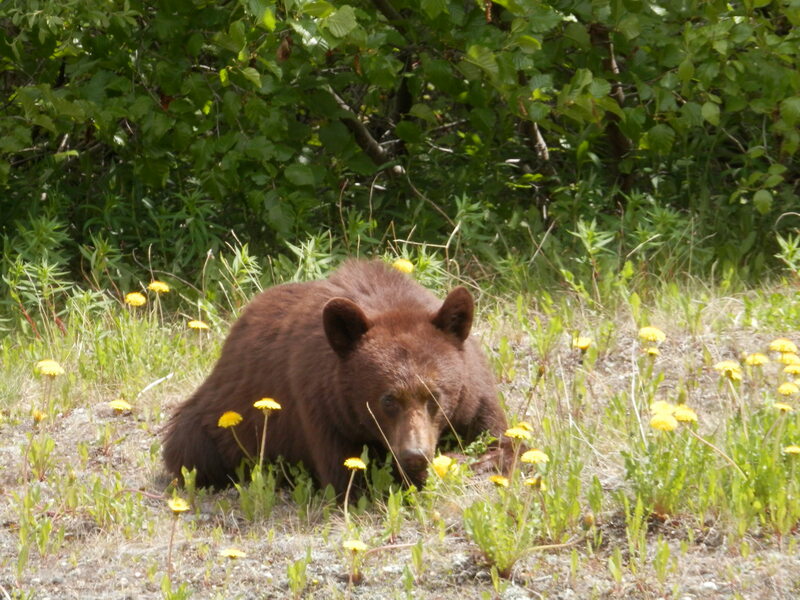 It was calmly eating dandelions at the side of the road. After we stopped, other vehicles joined us to see what the interest was about and one got close enough to scare the bear. He ran to a nearby tree and starting climbing. If you are ever chased by a brown bear, trust me, it will not help you to climb a tree. Wow, that bear was fast. He zoomed to pretty high in that tree within seconds. Our guide told us, how during the Gold Rush, the Canadian government saved the lives of countless “stampeders” with their requirement that each person crossing the board had to have enough supplies with them to last a year. Otherwise, they would have heedlessly rushed north without what they would need to survive. Accumulating enough provisions cost quite a bit of money and then transporting them presented a major challenge. Stampeders had a choice of carrying the large, heavy load in one trip – arduous, but faster than making multiple trips with smaller loads. Many men and horses died trying to make the difficult 33-mile trek to Lake Bennett, where they could float down waterways to their claims. Supplies for one man, for one year weighed as much as a ton – more than I packed for the cruise, even though my husband may not agree! It took 26 months, thirty-five thousand workers, and 450 tons of dynamite to build the White Pass & Yukon Railroad (WP&YR), completed in 1898. But when it was completed, the hardships of the gold rush miners ended. They were no longer required to walk the “Trail of 98” to cross White Pass. The railroad is a narrow-gauge (rails are less far apart than a standard railroad) that runs literally on a ledge blasted out of the mountain. On one side of the train, you are literally inches from the rock face of the mountain and on the other, it often feels like you are hanging over the edge. The narrow gauge required a smaller track bed and better accommodated the tight turns necessary in the route. The oldest railroad car was built in 1883 and is still in service today. Running along the Skagway River in the Tongass Forest, we crossed bridges and rode through tunnels. All the way, admiring the ruggedly beautiful scenery. It was a very full day of memory-making adventure! I would go with the Disney backed activities instead of booking your own, it is just worth it to have it taken care of for you. I love that you guys got to see and play with the dogs, how fun! Your trip looks amazing. I like how you were able to find exactly what you wanted with the help of Disney giving excellent perimeters for choices. You look as if you had an amazing time being able to travel the area. The pictures look great. Love to see Alaska and this would be a great way. The scenery is so beautiful. I love the animals and the railroad. Wow, that trips looks like one in a million. Memories were made forever. There are lots of beautiful pics. 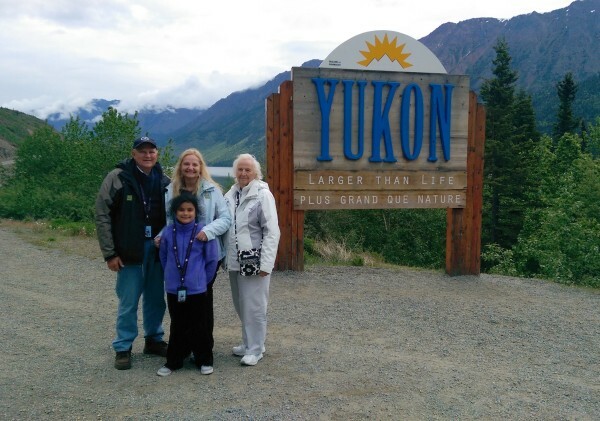 My parents have done several Alaska cruises, but I’ve always wondered if it’s something my kids would like. I can tell from this it will be! Everything is beautiful and I would love to do an Alaska cruise. So much fun! That looks like such an amazing experience!! I didn’t know Disney Cruises had ones to Alaska too! I thought they were only in Florida! The scenery is so beautiful! This just looks amazing. Getting there via Disney is even better. I would love to see the wildlife there. Wow! This looks wonderful! I love the great outdoors and what a great combo with Disney sailing adventure. I am so jealous. Looks like you had a great time. I need to do this! This looks beautiful! This looks like such a fun trip. Love the sled dogs! 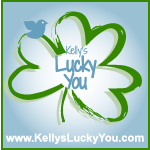 amanda hardesty recently posted..Have You Checked Your Credit Lately?? that looks so nice. 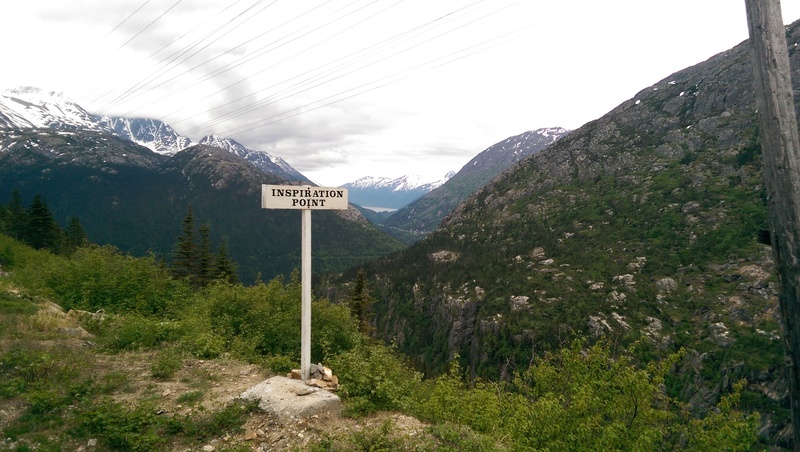 its exactly what i pictured alaska to be like. This looks like a ton of fun. I’ve become interested in mushing lately, but since I live in Iowa, my interest only goes as far as reading about it on the internet. ;) I’d love to visit Alaska some day! We had tours in the capitol and I went river rafting from the glacier to the sea. Love the pic of the bear. It looks so calm. This would e the perfect family cruise!